All the information YOU need to know! If you are here, you have a student preparing for college entrance testing. Take a minute to Subscribe our mailing list. You will get one information-packed email per week that hundreds use. Trust us…best thing you will do today! How do I register? Click here for registration. *Take advantage of the Test Information Release (TIR) report (see chart for available dates) for an additional $20 fee. You will receive a copy of the multiple-choice test questions used to determine your score, a list of your answers, and the answer key. (If you took the writing test, you will also receive a copy of the writing prompt, the scoring rubric, and the scores assigned to your essay by two readers.) You can order the TIR as you order the test, and you have up to 3 months after the test to request the TIR. Consider having your student take the ACT as close as possible to their completion of Geometry class. They will have the advantage of not having forgotten what they learned. Here is the math content covered by the ACT and some practice math questions. 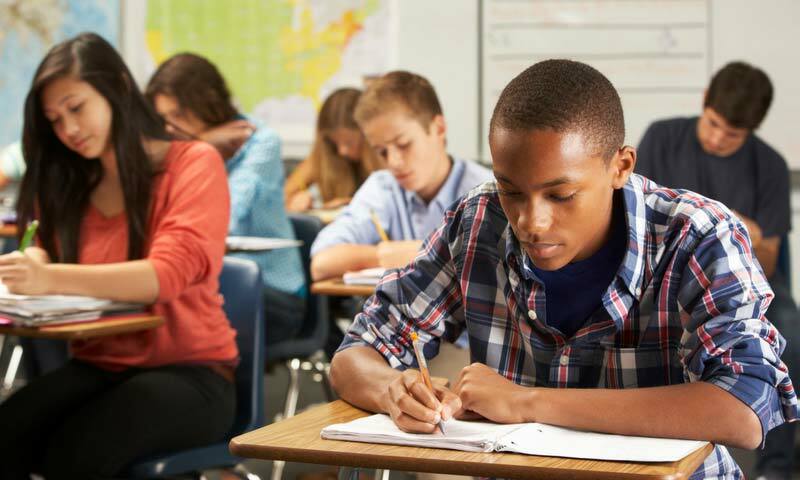 Nearly every student who takes the ACT the first time is shocked by the pacing – “it’s so many questions…I didn’t manage my time well enough this first time, but I will do better with that next time.” If possible, take a full real practice ACT before taking it on a national testing date. Read more about “clock shock” in our blog post from BWS Education Consulting. At The Core recommends ALWAYS taking the optional writing portion of the ACT. Here is an example of the writing prompt and scoring rubric from the December 2015 exam. It can give you an idea of what to expect. ACT has a new score report format starting September 2016. Click here to see what’s changed. You’re here because you need information on the high school to college transition. Join our mailing list to always get the latest! *Take advantage of the Question Answer Service (QAS) report (see chart above for available dates) for an additional $18. You will receive a booklet copy of the SAT questions and a report including your answers for the specific testing administration, the correct answers and additional scoring instructions, and information about the type of test questions and levels of difficulty of the questions. You can order this option when ordering the SAT or you can order it up to 5 months after the test has been taken. SAT Test Preparation includes practice tests, study plan, and question of the day. Click here for some test day tips. Be sure to check out Khan Academy®, the official SAT practice source. SAT Subject Tests are hour-long, content-based tests that allow you to showcase achievement in specific subject areas where you excel. Some colleges require or recommend that you take SAT Subject Tests. They can demonstrate your knowledge or be used for course placement. Subject tests are offered on the same dates as the SAT except in March. The PSAT/NMSQT is used to both practice for the SAT and to qualify for the National Merit® Scholarship Program. How do I register? The testing is done through your home high school in October of your junior year (some have option of taking it in their sophomore year for practice). Should my sophomore take the test? If you were thinking of taking the test just to practice for the SAT, that’s fine! But, we recommend taking the regular SAT test itself. If you wanted your student to practice in order to qualify for the National Merit® Scholarship, take the PSAT/NMSQT. After you get your results, you can connect your College Board and Khan Academy® accounts to get free personalized SAT study recommendations. Does the PSAT offer a QAS (Question and Answer Service) report like the SAT does? The online Score Report in the My College QuickStart is a supplement to your paper Score Report Plus. Some students may view the questions for each skill on the PSAT/NMSQT and PSAT 10 that were omitted, incorrect, and correct by clicking on each skill listed under the “Your Skills” tab. Once the student clicks on the skill on the right hand side they can view the number of the questions they omitted, got incorrect, and got correct. The student can then click on the number or click “view all” to view the question, possible answers, actual answer, and answer explanations. What if the online preparation tools aren’t enough? Check out our “Friends of At The Core” or this list of local/national tutors and resources provided by the Olentangy Local School District. Consider whether your student will be best served in a group class or by using a one-on-one tutoring service. The cost for these services varies greatly and will be a factor, but so should your student’s learning style and your time frame. Timing will be important! Don’t get into a tight spot and start looking for a tutor a few weeks before a testing date. They will be booked. Plan ahead….way ahead! A growing number of colleges and universities recognize that some students may perform well academically but struggle with test-taking. Many schools will allow the student to apply without submitting any test scores (“test optional”) and a few will not accept any ACT/SAT scores at all (“test blind”). The National Center for Fair and Open Testing calls these “Fair Test” schools. They have found that removing test scores from the picture allows for a more diverse student body, and they rely more heavily on GPA and class ranking as an indicator of college readiness. The number is growing all the time but currently stands at over 1000. Click here for a current list. DISCLAIMER – The purpose of this resource library is to assist our college-bound families. At The Core LLC does not endorse any vendors or authors. We will gladly remove any link from this website upon request from the linked entity; this website is not sponsored or associated with any particular linked entity; and the existence of any particular link is simply intended to imply potential interest to the reader.